Porto Club Vacations: OLD, TRADITIONAL COOKING METHODS WE USE STILL IN GREECE AND…WE LOVE IT!! THE G A S T R A: In Ancient Greece “gastra” was a food preparation concave utensil. When cooking food in the United States and many other countries, people use the resources that are available to their market. That means they use their stovetops, ovens, and occasionally the gas or charcoal grills that they may have outside. In Greece there are plenty of modern kitchens of course that are equipped in the same way as these kitchens, but that’s not the only way Greek people cook. In many regions of Greece things are a little different though and local people don’t count on Electricity or technology. Old traditional cooking methods are still commonly used, mostly in the villages and mountain areas. One of the different methods people still use to cook in Greece – especially in Epirus and Northern Greece is the GASTRA, a mobile oven I can say, a concave tin structure which had a handle so that it could be lifted and moved around when it is not hot. Below the handle there is a metal hoop to keep the ashes and coals warm. This cookware was and still is indispensable for transhumant shepherds, particularly the “Sarakatsani”, who move extensively all over the Epirus Mountains. With simple ingredients as wheat, corn, flour and salt and a pan on coals, covered by the all-purpose gastra, namely a metallic lid that converts a simple pan to an improvised oven, they cook not only pies, but also made bread and any kind of meats, greens and pulses. Light a fire with branches that burn quickly and produce coals in a matter of minutes. 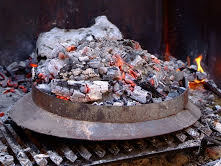 When the fire diminished t he gastra is placed on top with food or bread, covering it with the ashes and burning coals were put around and on top of it, sealing the mobile oven. Cooking is slow and thorough in this contraption and, as a result, it produced delicious foods as bread, pies, sweets, and roasts. 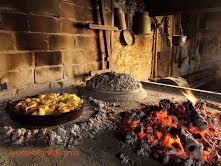 Cooked in the old day’s gastra oven with a bell-shaped lid that fit over a round baking pan, pies and foods doesn’t require a proper stove, any kind of electric energy and just a match or a lighter to be able prepare and cook your own bread and food. In our cooking holidays and classes we provide and teach exactly some of these old methods of traditional cooking!